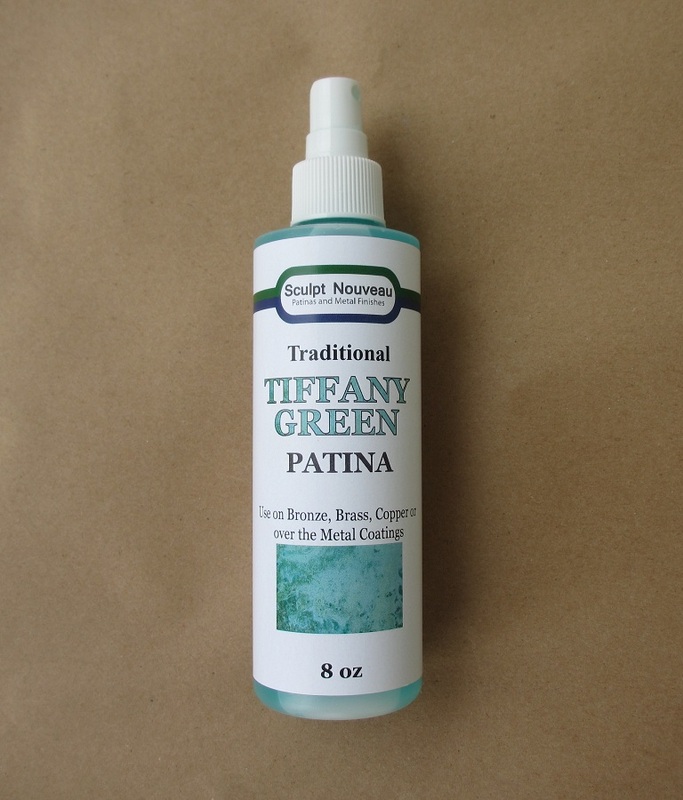 Bottled Patina Solution for Copper Sheet- Tiffany Green- 8 oz. Home > Bottled Patinas > Bottled Patina Solution - Tiffany Green- 8 oz. Bottled Patina Solution - Tiffany Green- 8 oz. This solution is used for creating a patina on copper, bronze, or brass. It is suitable for use on projects both indoors and out. This solution will produce a beautiful green patina that can vary in color from a light pea green (if applied lightly) to a brighter green with more bluish tones (if overlapped or applied heavily). The Tiffany green patina will begin to develop immediately but it will develop over a period of several hours before producing the final result. To use: First clean the metal thoroughly and allow to dry, Then spray, brush or sponge on the solution. It may be prefereable to start out with light coats and re-apply if a deeper color is desired. After 2- 6 hours the patina will be fully developed. When done, preserve the look with a clear sealant if desired. Coverage will vary based on the heaviness of application and the number of coats used. One 8 ounce bottle may cover 20 square feet or more. Copper Sheet after application of patina. This is one coat - sprayed on and dabbed with a sponge brush, after about 2 hours.